Belly Button Designs: Selfridges Mother's Day Collaboration - see the magic! Selfridges Mother's Day Collaboration - see the magic! We are very excited to announce we will be working in partnership with Selfridges, Exchange Square, Manchester and Selfridges, Oxford Street, London this Saturday 14th March to celebrate Mother's Day. Our skilled hand painters will be on hand to paint and personalise beautiful Belly Button Designs Mother's Day cards. You will be able to watch while we hand paint your Mother's Day card with your chosen message. After the success of our Christmas and Valentine's Day pop-up shops in December and February we can't wait to get started on Saturday, so come and see us, say hello! and get your Belly Button Mother's Day card personalised with a special message. 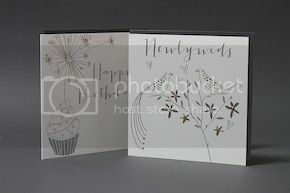 Each card is presented in a beautiful box with candy stripe ribbon and foiled tag. Fiona from our paint studio team is busy at the moment making the boxes and getting organised for Saturday. We have a collection of beautiful designs, which we will hand paint, sprinkle with glitter and finish with sparkling gems. If you can't make it down to Selfridges on Saturday to watch the magic as it happens don't worry you can pop by our website where you can order our hand painted cards and have them delivered in time for Sunday.